A damning report on the summer timetable shambles has laid bare the dysfunctional chaos of Britain's railways. Decision-making was 'not fit for purpose' and there was a 'collective, system-wide failure', said MPs. There was an 'extraordinary complacency' among government officials, rail bosses and regulators about 'protecting the interests of passengers', they added. 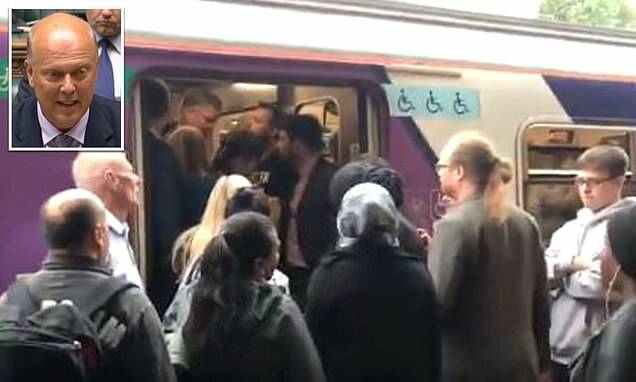 Transport committee chairman Lilian Greenwood said the news last week of an average 3.1 per cent rise in fares added 'insult to passengers' injury'. The committee concluded the Transport Secretary 'is responsible for the structure of the system. Some of the problems arose from the structure of the railways. It is therefore not reasonable for the Secretary of State to absolve himself of all responsibility'. The cross-party committee also blamed the 'fragmented' nature of the industry for the disruption. In Britain's 'astonishing' complex system, private companies compete on rail infrastructure which is owned and run by the state, it said. The MPs highlighted 'inadequate' governance and decision-making overseen by Mr Grayling and his department. 'Lines of accountability failed, were not sufficiently clear or simply did not exist,' they said.